Hey guys, hope to see your sweet, sweet faces at Free Comic Book Day on May 6th. 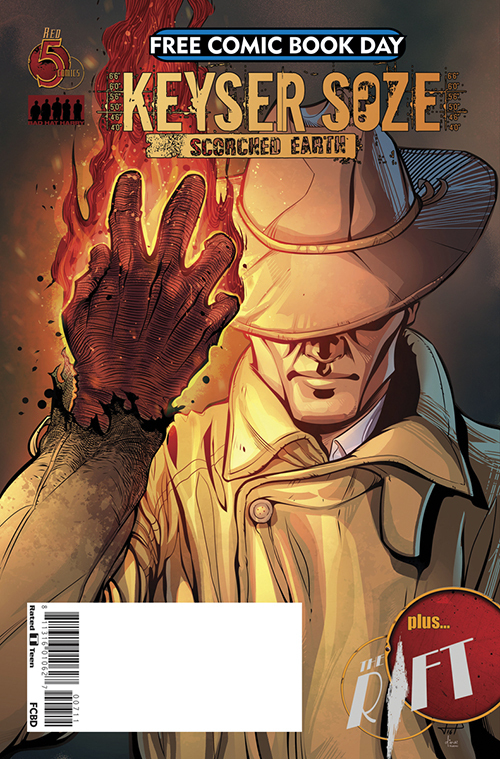 I checked out the previews for some of the free comics and my favorite so far is the comic book detailing the life of Keyser Soze before the events of The Usual Suspects (Keyser Soze: Scorched Earth). Also, there’s something in there about time travel because why the hell not? It seems unassociated with the Soze narrative, so I’ll leave that alone for now (the preview I read was only a few pages). What I find more interesting is the backstory of one of film’s most mysterious villains. I find it an intriguing concept because how in the world do tell the back story of an unreliable narrator? In Fight Club, our narrator is… Narrator, because he never really gets a name. Tyler Durden is everything our Narrator wants to be, cool, manly, anarchistic. Tyler is basically his id punching him in the face every Wednesday and Friday night at 8p.m. in the old Pizza Hut basement. It isn’t until the end of the book/movie that we learn that Tyler is an extension of the narrator, a stream of wild consciousness that he has lost control of. Speaking of losing control –American Psycho! Did you know that the book manages to be more horrifying than the movie? Trust me, it is. If you are squeamish about literally anything, I might pass this baby up and pick up some Nicholas Sparks. If you don’t put this book down at least once and whisper, “Oh my god…” then I’d rather not sit next to you on the bus. It is with some relief that the audience finds out towards the end of the book that Patrick Bateman has been fanaticizing/hallucinating about the grisly murders and mutilations we’ve been privy to. What all these characters have in common, other than being violent madmen, is a mysterious past. Even the Joker can’t keep his backstory straight. We see them in the context of NOW. Yes, the Narrator in Fight Club hates the lonely, neutered, consumerist he has become, but how did he get there? Would it give us more context to understand the character if we had a more complete backstory? For instance, would it be more interesting to the reader to find that he was from a nice, middle-class nuclear family and just lost it or was struggling against a dark, violent past? American Psycho gives little backstory on what drove Patrick Bateman to such a vividly violent fantasy life, although its predecessor Rules of Attraction introduces an almost equally screwed up younger brother Sean (I’m thinking Mr. and Mrs. Bateman weren’t passing out the hugs on a regular basis).